Children splashing in the surf, live music crooning from the deck at Boonedocks, the “yum” of a mouth enjoying cherry pie. These are the typical sounds of high summer in Glen Arbor. But during one extraordinary week this August, the sounds that dominated our town were the whirr of winds and the ugly crack of trees, followed by the buzz of chainsaws, the hum of generators, and the cheers and car honking as Consumers Energy trucks rolled into town like a liberating army. 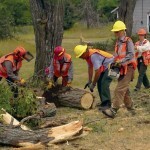 The megastorm that pummeled Glen Arbor and the Sleeping Bear Dunes National Lakeshore on August 2 severed hundreds and hundreds of old-growth trees; it made all roads to Glen Arbor impassable; it caused millions of dollars worth of damage; it brought the local tourism industry to a grinding halt for days on end. But, no one died, despite several near fatalities. And the storm of August 2015 left us with stories that we will share around campfires and kitchen tables for the rest of our days—long after the pages of this newspaper turn yellow. The destruction in the wake of the storm also sounded a clarion call to action for Glen Arbor townspeople, business owners, visitors, and emergency personnel to step up and help one another. Within hours, the injured were safe; within days, the roads were clear and businesses were open again; within a week, Glen Arbor seemed back to normal, cruising along at its frenetic August pace before the tourism season ends abruptly after Labor Day weekend. Once we clear the trees and the brush, repair the roofs and the cement, and replace the destroyed cars, the casualty that remains will be the gaping hole in our forest: the canopy that once guarded Alligator Hill, but which we’ll never see again. If we replant the trees, our grandchildren, or our great-grandchildren, may some day hike there, picnic there, propose marriage there. Here’s a recap of that scary, exciting, and memorable week in Glen Arbor. But Ockaskis was lucky. There were no trees around her. In Glen Arbor, Carol Worsley was in her office above the detached garage at her Thyme Inn bed & breakfast when the air changed. She struck her head but did not break anything, and she got out of the garage only to see that it was cut in half by a century-old oak tree that had landed right where her desk typically sits. Battered and bruised, Worsley was grateful that she was not—what she joked—“Glen Arbor’s only fatality. I feel very lucky!” Days later, Worsley still had a headache and went to Traverse City for an MRI to make sure that she had sustained no hidden damage. A mile away, at D.H. Day Campground, a young mother was sitting in her tent, holding her baby, when the storm arrived. She suddenly realized that the tent wasn’t a safe place to be. So she and the baby moved into their vehicle. Within minutes, a tree fell onto their tent. Had they still been there, it might have killed them. This story was told to Sleeping Bear Dunes National Lakeshore chief interpreter Merrith Baughmann when National Park officials evacuated, and closed, the campground. On Dunn’s Farm Road, just east of the Glen lakes, a 47-year-old Colorado man’s car was hit by a tree limb as he was driving to pick up his son who had reportedly gone for a jog. The man, who was wounded, was cut out of the car by fast-thinking neighbors, transported by pontoon boat across Big Glen Lake to the Narrows Bridge, and then taken by ambulance to Munson Medical Center in Traverse City. He reportedly sustained several fractured vertebrae but will recover. The storm didn’t stop Glen Arbor native Sam Duwe and his fiancé, Kate Newton, from tying the knot, which they had planned to do on this day at the Glen Lake Yacht Club. En route to the ceremony site, the bride was with her future mother- and father-in-law when the storm hit. The megastrom dropped hundreds of trees over M-22 and Dunn’s Farm Rd, closing all access to Glen Arbor. Photo by Paul May / Glen Arbor Artisans. “The next thing, a giant limb fell and hit the top of the car, and it was only a matter of one or two minutes from that initial limb falling that we were totally blocked in and trapped,” Newton told 9&10 News. So Newton got out and walked. When her shoes became a burden, she climbed barefoot over several downed trees, as people along the way cheered her on. Newton’s arrival at the wedding was “pretty epic” said the groom. The ceremony continued in candlelight. But most of Northern Michigan suddenly found itself in the dark. Electricity was knocked out throughout Leelanau County and the Traverse City area. The free, outdoor movie at the last night of the Traverse City Film Festival was abruptly canceled. Trees littered the landscape. All three roads leading to downtown Glen Arbor were blocked. The Sleeping Bear Dunes National Lakeshore shut down operations at the Philip A. Hart Visitor Center in Empire, Pierce Stocking Scenic Drive off M-22, the Dune Climb, the Sleeping Bear Heritage Trail, Glen Haven beach, and the D.H. Day Campground. Meanwhile, without electricity, restaurants in Glen Arbor closed their doors—all except Art’s Tavern, which turned on its generator and continued to serve burgers and pints of beer. The Township Hall became an impromptu shelter for those who were stuck in town and couldn’t get home or to their hotels. Randy Chamberlain, chef and owner of the upscale restaurant Blu, donated nearly 100 duck confit dinners to the Town Hall and served them on a folding tale under a basketball hoop. Accompanying the duck was salad, risotto, spaghetti, and profiteroles. Wine was not included. Dave Gersenson, owner of the Sylvan Inn and the Glen Arbor Lakeshore Inn as of last month, had 20 beds to fill because his Sunday evening guests weren’t going to be able to reach Glen Arbor. So he walked to the Town Hall and offered those rooms to stranded people for steeply discounted rates. As the sun set over Sleeping Bear Bay, Bloomfield Hills native Clare Lanesky happened to point her camera toward the horizon and snap a photo of unique looking clouds hovering over the water. Her photo shows the bear clouds. Or perhaps it was the sleeping bear and her cubs, watching over Leelanau in its time of need. In the storm’s wake, Glen Arbor residents immediately recognized that the destruction they had witnessed was unprecedented for our town. This was worse than the 1987 summer storm, Funistrada owner Holly Reay said. In fact, it was far worse. 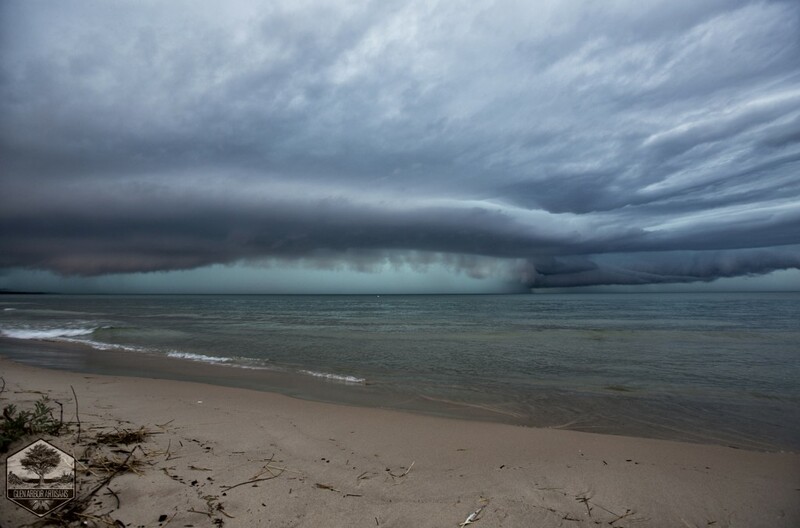 The storm was more powerful and more destructive than any other Glen Arbor storm ever recorded. Soon, statistics emerged to prove it. Jeff Lutz, meteorologist with the National Weather Service (NWS) in Gaylord, clarified that—while Sunday’s storm was not a tornado—the straight-line winds which accompanied the sudden thunderstorm reached speeds of 100 miles per hour. That’s strong enough to be called a tornado or a type-2 hurricane. More significantly, the storm blew away the previous wind-velocity record for Leelanau County. According to the NWS, on September 13, 2005, a barrage of wind traveling at 63 miles per hour hit Leland and Empire. But 63 is not even close to 100. 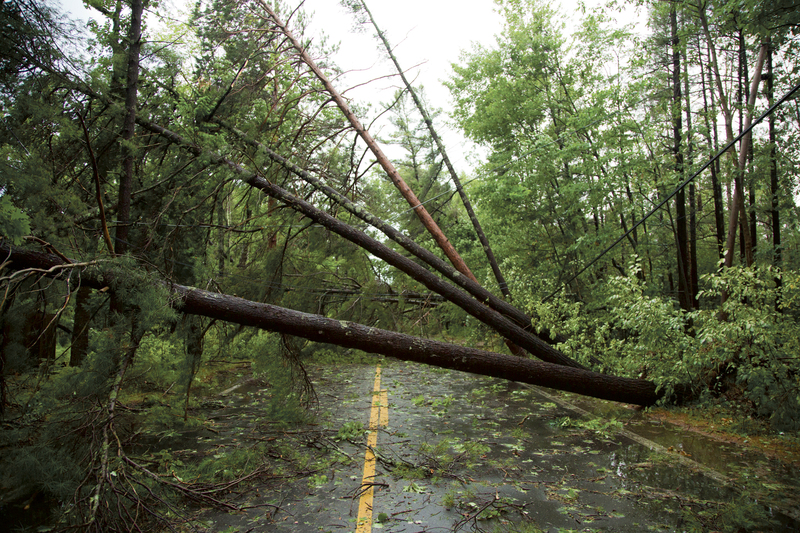 The August 2 storm was clearly the strongest to hit Leelanau County since recordkeeping began in 1950. The message that Glen Arbor had been decimated seemed to spread faster than 100-mile-per-hour winds. Around the nation and the world, hundreds of thousands of viewers gaped as they logged onto Facebook, Twitter, and YouTube to see the imagery from the storm. “Glen Arbor” was the top trending topic on Facebook. Our friends at the Glen Arbor Sun attracted more than 47,000 views to their website on Sunday and 116,000 on Monday—more than 10 times their previous record. Leelanau County officially called for a State of Emergency declaration and used a press conference in Traverse City to appeal to the state and federal governments for help recouping costs after the storm cleanup. Meanwhile, receptionists at The Homestead had the unenviable task of calling guests and encouraging them to find other accommodations in Northern Michigan; most visitors who had already checked in then left the resort on Monday. Coming from my house near the Grand Traverse-Leelanau county line, I drove to as far as I could get on Dunn’s Farm Road—the Foothills Motel and Café—and then set out by bicycle to reach Glen Arbor. But rather than pedal forward, I found myself walking 10 steps and throwing the bike over one downed tree, followed by another, followed by another, for at least half a mile. A machete, or an Abrams tank, would have been more effective than a bicycle. In downtown Glen Arbor, itself, residents were already pulling themselves out of the morass. Web designer Molly Connolly started a Google document with up-to-date information about the unfolding situation. Anderson’s Market got a generator, re-opened, and struggled to keep up with the demand for ice and water. Cherry Republic hauled out a gas grill and began cooking hot dogs for pedestrians on Lake Street. Tourists who needed to eat should have another option besides Art’s, which was slammed, thought Cherry Republic vice president Jason Homa. Plus, tourists needed to see a sense of normalcy returning to Glen Arbor. Nearby, at the Glen Lake Narrows, marina owner Carol McCahill sounded the call via social media that her staff would pick up anyone who was stuck in their lakeside homes, particularly along decimated Dunn’s Farm Road. I sat outside Cherry Republic’s café and enjoyed a cherry-chicken-salad sandwich and a Boomchunka cookie, like I had a thousand times before, while Cherry Republic CEO Bob Sutherland rolled down Lake Street on his tractor looking for brush to clear. Tuesday brought both good and bad news. To the east of Glen Arbor, M-22 opened to traffic, which meant that people could get between town and The Homestead. Northwood’s Hardware acquired a generator and opened, offering flashlights, candles, water, and generators to anyone in need. Leelanau County set up a call-in number for homeowners to report damage for future attempts to recoup costs later on. Merrith Baughman announced that the Park would cancel this weekend’s Port Oneida Fair, the popular annual celebration of pioneers and farmsteads in the Port Oneida Rural Historic District that is located several miles north of Glen Arbor. The loss of the fair felt like a blow to the stomach for some, who look forward to this event all year. The blackout also brought strange bedfellows together: even Buckeyes and Wolverines. I met a couple from Columbus and a couple from Ann Arbor who were sharing a gas grill together near the mouth of the Crystal River. Acknowledging that aid workers and food supplies weren’t able to reach the hardest hit areas, Leelanau County Sheriff Mike Borkovich appealed to residents of Dunn’s Farm Road to help each other. “We’re asking people to be neighborly, to help each other,” he told the Sun, adding that if you have stockpiled food or water for an occasion like this, and your neighbor needs fresh water for baby formula, please offer to share it. On Tuesday night, I found Bob and Stephanie Sutherland and their boys ducking tree limbs while walking down M-22, south of Glen Arbor, to survey the damage. I interviewed them on video (watch it on GlenArbor.com), and they spoke of Glen Arbor being the ideal place to be when a natural disaster hits, because you can count on each other. 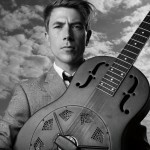 Sutherland thought aloud about starting a crowd-funding campaign to begin replanting trees on Alligator Hill, whose wanton, naked destruction appears behind him in the video. Almost no one could believe it, but one lane of M-22 to the south of Glen Arbor and Dunn’s Farm Road were more or less open by Wednesday. The tree cutters, sawyers, and chainsaw-wielding magicians had done a remarkable job of clearing in three days what might have taken others weeks to do. At the makeshift shelter at the Glen Arbor Town Hall, the food was good, but no longer gourmet. Chamberlain and Blu were no longer serving duck confit; the Salvation Army was here instead. Early in the afternoon, a sheriff’s deputy announced at the Town Hall that 70 extra bucket trucks had arrived and that linesmen were using Glen Lake School as their headquarters for trying to restore power to Glen Arbor that day. Meanwhile, Win Williams, relief director of the Southern Baptist Convention of Michigan, appeared at the Town Hall, met with Township supervisor John Soderholm, and offered to provide—at no cost—relief to private homeowners who had trees or debris in their yards, on their vehicles, or on their homes. His team of altruistic volunteers would be housed in Empire while they helped to clean up after the storm. Interested parties were encouraged to sign up at the Town Hall. But the excitement over a fast recovery was too hasty. On Wednesday afternoon, Consumers Energy announced that it was re-closing M-22 south and Dunn’s Farm Road, in order to re-string power lines. And its timeline for restoring electricity to Glen Arbor was pushed back to Friday afternoon. The damage was vast. Four days after the storm, many of Glen Arbor’s shops and galleries grew restless. They opened, despite not having electricity. The message was clear: the town was open for business. Up M-22, The Leelanau School opened its gymnasium for the public to use bathrooms and showers, while The Homestead turned its previously scheduled concert on Bay Mountain into a benefit for storm victims. Cherry Republic’s “Orchard Report” e-newsletter revealed Bob Sutherland’s “Bring back the arbor” campaign. The company said that it would match each dollar spent to replant trees on Alligator Hill. Then at the M-22 Store, Matt and Katy Wiesen decided that $10 from each sale of a Glen Arbor Love shirt would go toward helping their employees—eight of them—to repair or replace their vehicles that had been damaged by the storm. At long last, at around 2:30 p.m. on Friday, electricity returned to Glen Arbor, prompting cheers among the staff at Cherry Republic. It meant that the Dune Climb and Pierce Stocking—the crowned jewels of the Sleeping Bear Dunes National Lakeshore—would be able to open on Saturday. Suddenly, Glen Arbor somehow appeared normal again. The economic damage, we don’t yet know. Losing three full days of business is “a very, very large number for us,” The Homestead CEO Bob Kuras told Crain’s Detroit Business on Friday. Moreover, Cherry Republic lost one-quarter of its typical Glen Arbor sales last week. And while Art’s stayed open, it cost $400 a day to run the generator, Tim Barr told Crain’s. Early in September, we’ll know how many fewer visitors the Sleeping Bear Dunes National Lakeshore received in August, particularly during the week following the storm. But just as the social-media machine named Sleeping Bear “the most beautiful place in America” four years ago and pronounced it drowned after the storm, the same social-media machine declared that Glen Arbor was back on its feet. It’s mid-August. Art’s is packed. Hotels are full. Cash registers are humming. For Glen Arbor, the show goes on. Feature photo: The 100 mph wind shear over Sleeping Bear, just minutes before it pummeled Glen Arbor on Aug. 2. Photo by Paul May / Glen Arbor Artisans.